Tallink is one of the largest passenger and cargo shipping companies in the Baltic Sea region operating on seven shipping routes with twelve ships under the brands of Tallink and Silja Line is a company that wanted to make their ships’ digital signage systems consistent and centrally manageable, with central organised media creation and delivery AND chose ONELAN digital signage to achieve this. Seven ships in Tallink’s fleet already have digital signage systems installed, and because some of the systems were from different providers, content had to be created in 3 or 4 different formats and with different resolutions. 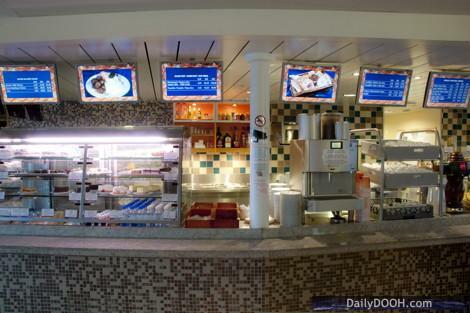 Furthermore as the digital signage was standalone for each ship, all media had to be provided to individual ships on USB sticks every time changes and updates were required. The ONELAN digital signage system was installed and is managed by SiseTV. 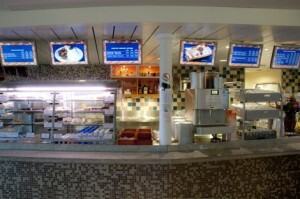 The digital signage on all Tallink Ferries’ ships is managed centrally from land via a single ONELAN media player. Local information is added and updated on the ships by information clerks, shop managers, cruise managers. The more sophisticated content and system management is undertaken by SiseTV. This entry was posted on Tuesday, October 26th, 2010 at 10:30 @479 and is filed under Scuttlebut. You can follow any responses to this entry through the RSS 2.0 feed. You can leave a response, or trackback from your own site.